No. PT 14515-14516, Persiaran BG Perdana 8, Perindustrian Batu Gajah Perdana, 31550 Pusing, Perak, Malaysia. Starting out as a small family business 2 decades ago, Kewpump has since moved on to be one of the leading pump manufacturers in South East Asia. Our vision of providing quality and innovative pumping solutions to meet client's needs is the reason why today Kewpump's products are installed and use by various industries in Malaysia, Indonesia, Singapore, Vietnam, The Solomon Islands, Thailand, Papua New Guinea, countries in South America and Africa. 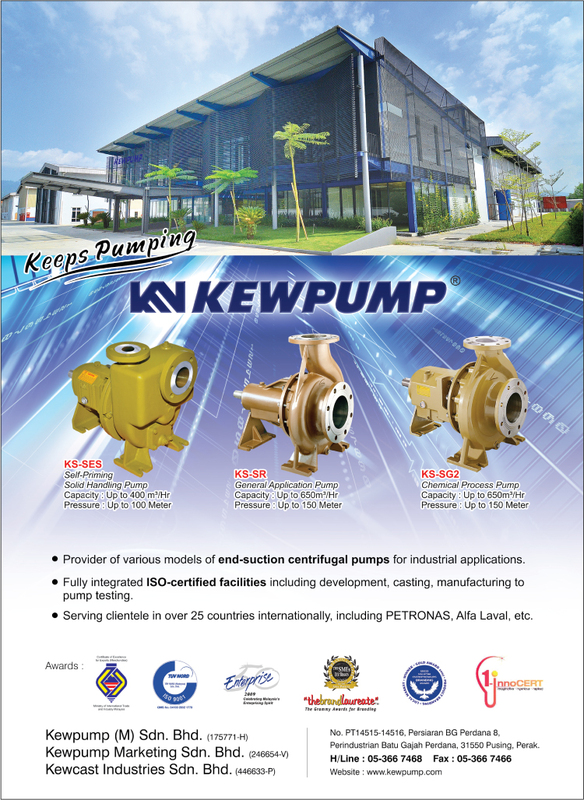 Based in Ipoh, Perak, Malaysia, Kewpump has 3 manufacturing facilities around the city. Our facilities enable us to perform full-scope manufacturing from designing parts, casting, machining, assembly and testing of our products. Kewpump pumps are manufactured using cutting edge technologies and are performed under strict quality control procedures that are ISO9001:2000 certified.As a result Kewpump pumping solutions are well known for its reliability and excellent value. As the company grows from strength to strength, so does Kewpump's pool of dedicated employees. Offering brilliant career paths, Kewpump has managed to attract many talented minds into its expanding family. With strong traditional values of innovation, service, quality and integrity as well as an army of dedicated employees; Kewpump has not only become one of the leading pump manufacturers in the region but has been honoured to receive various award for its products and market achievements.